People lose their hair for many reasons. 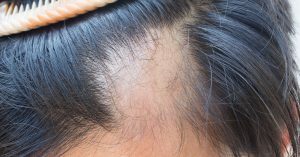 The most common reason is androgenetic alopecia, which is known by most people as male or female pattern hair loss. It is a condition that takes place over time with hair loss forming in the crown or temple area for men and in the front area of the scalp for women. Another major cause of hair loss is called effluvium, which is a condition where hair usually sheds more quickly. The most common form is telogen effluvium, which occurs during a point in the hair growth cycle when hair tends not to grow. Another type of effluvium called anagen effluvium occurs when hair is in its growth stage. RHRLI wants you to know about this condition and if you’re looking for a permanent solution to hair loss or thinning hair, we can help. We’re the only hair loss treatment center on Long Island that has the ARTAS® Robotic Hair Transplant System. The different types of Effluvium are classified by the stage of hair growth they occur in, according to Medscape. So it’s instructive to look at the hair growth cycle. As mentioned above, the Anagen phase is the period when hair growth is most active, growing 1-2 centimeters a month. When the cycle moves into the Catalan phase, hair growth activity decreases in this transitional period. Finally, there is the Telogen phase. This is a resting phase during which only small hairs with club-shaped roots remain anchored to the follicle. Anagen effluvium occurs more quickly than telogen effluvium, according to the American Hair Loss Association (AHLA). The condition is very frequently related to taking medications for cancer, with hair loss usually coming within two to four weeks, and major hair loss may develop in extreme cases, according to the Trichological Society. Among the causes are chemotherapy drugs, radiotherapy, oral contraceptives, vitamin A poisoning, iron deficiency, malnutrition, seborrhoeic dermatitis, other localized dermatoses and chronic infections. Cancer drugs are designed to inhibit rapid cell proliferation, according to AHLA.That’s a good thing when you’re trying to stop the spread of cancer cells, but the medications also affect the cells needed to grow hair. Some patients can pull out clumps of hair by hand within weeks of taking the cancer drugs. But the flip side of this is that recovery from anagen effluvium is rapid. It can start as soon as whatever caused the condition is removed. For cancer patients, that means starting to see new hair growth within a month of ending a drug treatment course. Hair follicles are not damaged by anagen effluvium, so they will grow back as healthy as they were before. While it’s rare that this condition isn’t caused by some of the factors listed above, it could become chronic if the cause isn’t found. If you’re looking for a permanent solution to hair loss, RHRLI can assist you. The ARTAS® system is minimally invasive and won’t leave long recovery times like other hair transplant procedures. To learn more, contact RHRLI today.